hitting the nosing of a tread. 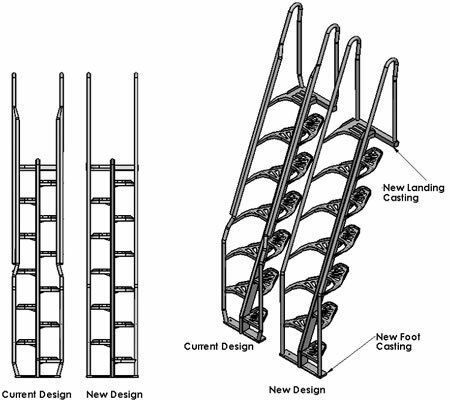 our unique, alternating tread design with the advantages aluminum has to offer. is available for roof hatch applications. Click a Price of the item you wish to purchase. *Contact us for Optional Color Charts. as it is manufactured exclusively for us by PS Doors. Universal Pivot Clamp Bracket to fit railings up to 2" OD. two (2) springs per gate, housed within hinge pivot. 2. Hot Dip Galvanized. Fasteners to be zinc plated. not polished. Fasteners to be stainless steel..
 Overall Vertical Height: 30-1/4"
 Allows for 180° travel. between handrails on two adjacent stairs). (not included) at top and bottom. sections, apply to work of this section. in accordance with the Drawings and Specifications, and including fabrication and installation of Alternating Tread Steel Stairs. concentrated 1000 pound load without permanent deformation. per linear foot applied in any direction at any point on the rail. welded to stringers of like material. 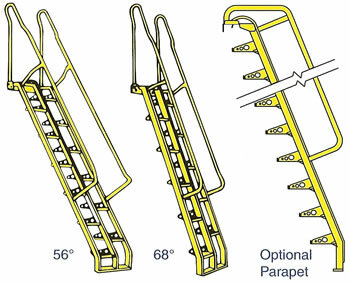 the landing at the points of a handrail attachment. provided for field attaching to the central stringer. base of the stair will be secured. B. Substitutions will not be considered. vertical feet and for 68 degree stairs over 12 vertical feet. cold drawn, fully annealed tube per ASTM 513.
vertical feet and for 68 degree stairs under 12 vertical feet. annealed tube per ASTM A513. 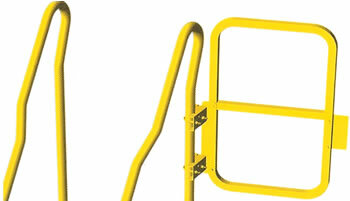 handrails with included bolts using the specified materials. alternating treads with all other related and adjacent work. and that substrate is in proper condition for stair installation. A. If bumper has not been installed at the factory, install the self adhesive bumper. finished floor or roof surface. with not less than 2 at bottom of stair. galvanized repair paint in accordance with ASTM A780. Leave work area clean and free of debris. 1000 pound load without permanent deformation..
applied in any direction at any point on the rail. A. Cast Aluminum Treads, Landings, and Mounting Base: shall be shielded metal arc welded to a single extruded box-like stringer. B. Tread Castings: shall have integrally cast handrail support arms which are precision machined and welded to continuous aluminum handrails. 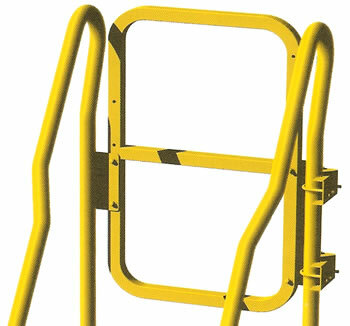 and all treads shall have upturned integrally cast skid barriers. sliding of the hands unimpeded by the handrail supports. shall be attached to the central stringer. where the foot of the stair will be secured. 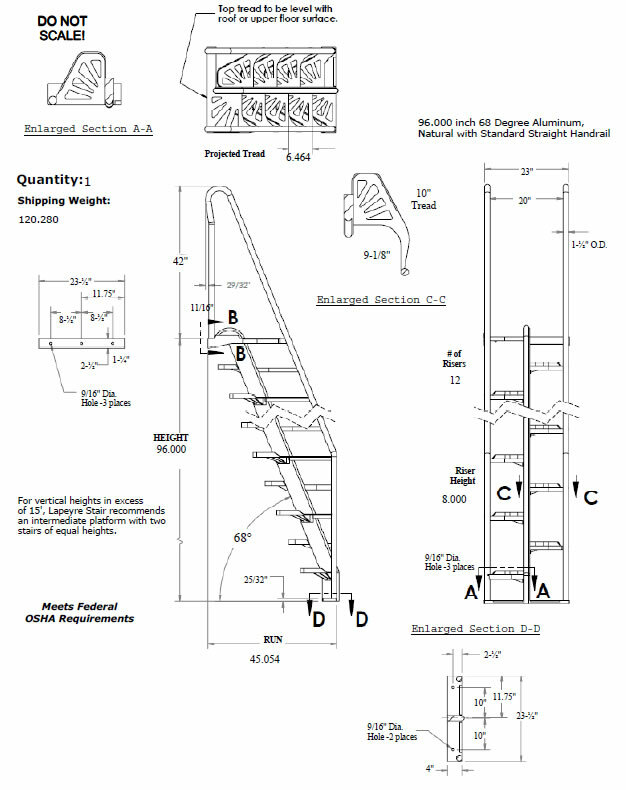 B. Fabricate gas metal arc welded and/or gas tungsten arc welded alternating tread aluminum stairs using the specified materials. A. 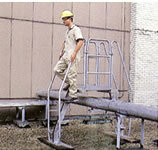 Coordination: Coordinate start and installation of aluminum alternating treads with all other related and adjacent work. operations will not damage stair installation. proceed to install until all necessary corrections have been made. Leave work areas clean and free of debris. 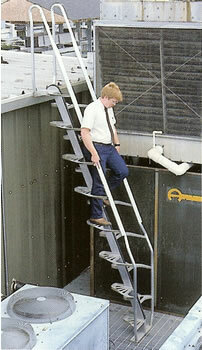 Aluminum Stairs, and Alternating Tread Stair from your complete source for material handling equipment.